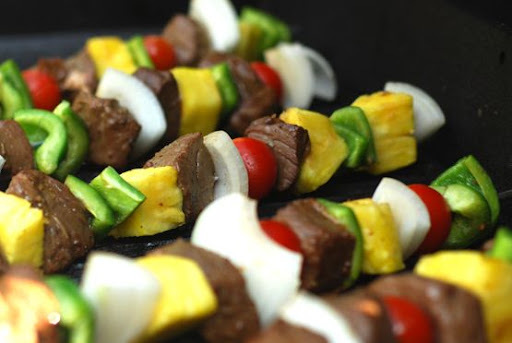 One of our favorite things to grill in the summer is shish kabobs. When friends are coming over for dinner, it's one of our favorite "go-to" meals. We have done so many variations over the years - beef, chicken, shrimp - and used a variety of vegetables. 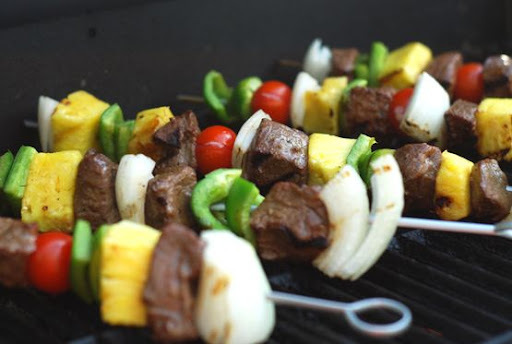 The sweet, tart flavor of grilled, fresh pineapple served alongside grilled vegetables and beef, chicken, or shrimp is just deliciously wonderful! 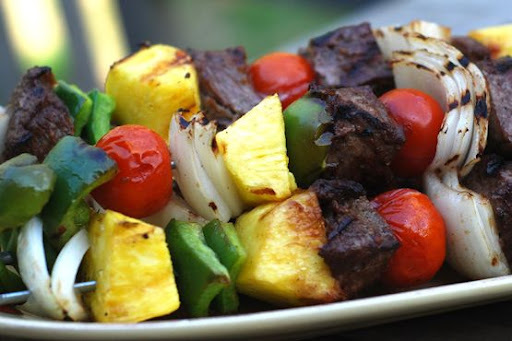 This recipe is our family recipe for Shish Kabob Marinade. It comes from my husband's family, and every time we've branched out and tried a new marinade, we still come back to this one as our favorite. It's simple, doesn't overpower the meat and veggies, and gives the meat a ton of flavor. This is my favorite combination. But, you can use different types of beef, chicken, shrimp with this marinade, as well as finding your own favorite combinations of vegetables. We serve kabobs stacked up on a long platter like this. It's a great way to serve them when you're having company over. It makes a great presentation. Combine ingredients in a gallon-sized bag, or in a covered dish. Marinate at least 4 hours, or overnight. To grill: Preheat grill. 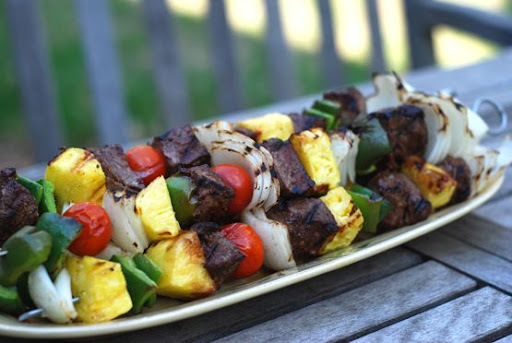 Place marinated meat, vegetables, and pineapple on skewers (wooden skewers work great, too). Grill for 5 minutes on each side, occasionally basting with marinade. Total grill time should be about 10 minutes - may be slightly longer for chicken. Just check - you'll know when they're ready. *When grilling shrimp, we grill the shrimp on separate skewers, as shrimp only take about 5 minutes to grill, and the vegetables take the full 10 minutes. Monkey see, monkey definitely will do. These are perfect for someone on the South Beach Diet (*ahem* me). Yummy, we LOVE shish-kabobs also. I just made some for Memorial Day, using a Hawaiian meatball recipe. Of course, with pineapple! It is so good and something about the sweetness goes along so well with the onions, peppers, and meat. They are so pretty too! Yes - I know this will be good because it's your recipe! I love Shish Kabobs anyway so will be trying this. And the mashed potatoes - they look heavenly! Note to self: never read your blog right before lunch. I'm likely to empty the refrigerator now. Those look awesome! I love grilling season! Yay!! Thank you so much! I was digging online for a good marinade recipe for shish kabobs and stumbled across your blog. Now I have one that looks good! I am going to serve over Jasmine rice.... I can't wait to search through your other recipes!